St.Maarten Deep Sea Fishing And Beach Excursions. St. Maarten Deep Sea Fishing and Beach Excursion. Deep Sea Fishing open season in St Maarten / St. Martin for Sailfish, Marlin, Wahoo, Tuna Mahi Mahi and Dolphin is ongoing. 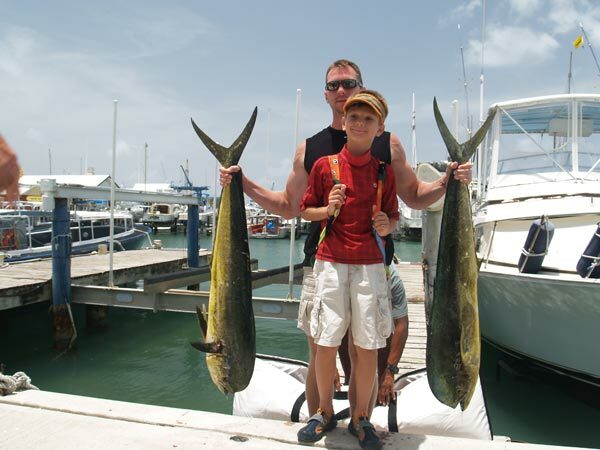 Deep Sea Fishing St Maarten / St. Martin is an outstanding opportunity to get adventurous moments in your life. St Maarten / St. Martin is one of the largest salt water fish destinations in the Eastern Caribbean. The weather conditions for fishing in St Maarten / St. Martin is perfect with a combination of calm sea and excellent visibility. The one-half (1/2 day) trip and three-quarter (3/4) day trip (depending on sea conditions) will take about a 20 minute run before you start fishing. The area is actually a ledge that runs the length of St. Maarten out to the South and past St. Barth’s and this is a favorite hangout for big game fish of all species. Captain Lance and crew will work with you to lengthen or modified service to synchronize your deep sea fishing plans and expectation. All this to ensure you gain a memorable and unforgettable Get-a-Way Experience. The Raphaella is a deep sea fishing boat in St Maarten / St. Martin that accommodates all levels of fishing skills, from very beginners to veteran professionals. For superior amusement St Maarten / St. Martin fishing action, cruising on the Raphaella is the best way to go. St Maarten / St. Martin sports boat, the Raphaella, also provides island transfers for those who want to move from one part of the island to another over water.